The phrase “autumn of art” is wonderfully familiar to the Japanese, and right now is the ideal season to appreciate works of art both inside and outside the gallery; the mild weather and golden falling leaves only enhance their beauty. 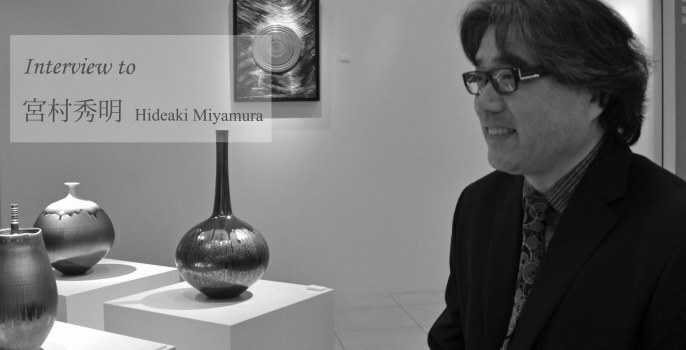 In October, Gallery Sakuranoki welcomes Hideaki Miyamura, a ceramic artist active in the United States, and hosts his solo exhibition; this is his second show in Japan after an interval of four years. We spent some time with the artist in Tokyo discussing his work and upcoming solo exhibition. Because I like doing it. So, it’s just something that can’t be helped even though the success rate is low. I have no control over what will be a successful piece. It’s like I am in a sort of Zen selfless state (laughter). No matter how often I fail or the pieces break, I really have no choice but to keep on going until a piece I like finally emerges from the kiln. Of course, it’s hard, but if I were to feel bad about them each time, I would make no progress (laughter). Just an hour’s drive from Boston, Hideaki Miyamura’s home in New Hampshire is a quiet house standing alone in a beautiful oak and cedar forest. A little further into the depths of the forest sits his studio and a kiln built by Miyamura; the whole site is completely surrounded by trees and the sounds of nature. In his own words he said his studio is “my cocoon, the place in the world where I am most at ease.” Ten years ago, he moved to his present idyll from a town two hours’ drive from Boston, and built his studio; later, two friends, not ceramic artists, joined him and currently they share the house. [Iwaseki]　In 2009, I visited your studio, and discovered some intriguing aspects about your work including a technique that just by looking at your work in hand I could not understand. Firstly, I saw a white clay or perhaps it was a kind of sand being finished on a potter’s wheel; I understand that it can withstand a high temperature of 1,320 degrees. I strongly felt you were creating blown glass-like shapes in ceramics that are formed against gravity; it is as if they had been perfectly inflated like a balloon. I was also surprised at the thickness of the glaze you applied to each piece. But the thing I remember most was your delightful smile as you faced each failure and shrugged it off. Some people might say your 13,000 experiments mixing glazes and adjusting temperatures are rather excessive, but in fact, that was four years ago, so just what is the number today? It must be astronomical! [Iwaseki] In addition to researching into glaze, you are also taking on challenges with shapes. Your vases are charming and transcendental, sometimes narrowing to the width of a single flower stem. To achieve the beauty of formation that is only found in your works, I have heard you have a particularly high failure rate in production. [Iwaseki]　I am curious how you keep smiling and are so lighthearted when you tell the story about works made with so much effort exploding inside your kiln. [Miyamura] All I can say is because I like doing it. It’s like I am in a sort of Zen selfless state (laughter). No matter how often I fail or the pieces break, I really have no choice but to keep on going until the pieces I like finally emerges from the kiln. Of course, it’s hard, but if I were to feel bad about them each time, I would make no progress (laughter). [Iwaseki] I know that people all over the world really admire your tenacity. In Boston as well, you also held a solo show titled “Risk of Discovery.” I feel much inspired by your meticulous research into glazes and your quest for perfection in your creative activity, your passion and dismissal of risk; not to mention, your constant charming smile. [Miyamura] My book currently in preparation for publication in America is also titled “Risk of Discovery” and will include some of the works exhibited this time.